US Open 2018: E true wetin Serena Williams tok say Tennis dey favour man pass woman? "Im neva collect game from any man sake of say dem say im be thief, but I don see oda men call oda umpires several tins." 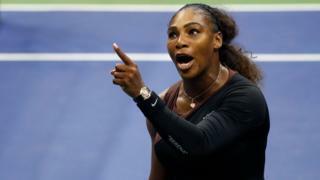 Dat na wetin Serena Williams tok afta she accuse di umpire Carlos Ramos say e dey 'sexist' for her US Open final loss to Naomi Osaka on Saturday 8 September. Serena kwanta wit di umpire na di latest chapter of long debate wey no start today about women tennis, equal pay and how male athletes and administrators dey tok about female tennis players. But di kweshon still tanda for ground - Tennis dey favour man pass woman? Di Women's Tennis Association (WTA), Chief Executive Steve Simon, support wetin Serena do. She say "difference no suppose dey for di standard of tolerance to di emotion wey man and woman tennis players dey show." Issue still dey about how much dem dey pay women? Nigeria journalist Latipha Adebayo, wey dey follow di sport wella tell BBC Pidgin say "she no believe di sport dey sexist" as most of di tins like "players welfare, prize money don dey ok."
For many years, women no dey get di same money like men, but dat one don change as evribodi dey earn di same money now for grand slam tournaments, even though sponsorship for tennis players dey different. "Make athletes wear wetin dem want wear"
Recently, di French Open organisers ban Serena Williams Cat suit dress as dem believe say e dey against dia dress code ethics. Latipha tok say "fans dey react differently wen dem see woman for court." "But wen athletes wan dey stylish wit dia outfit as long as e no break any rule, dem suppose allow dem," she tok. Judges dey fair to man and woman tennis athletes? Former US tennis star, Andy Roddick, wey don retire bin tweet say e don tok "worse tins" pass wetin Serena tok and "im neva get game penalty before." But dat one mean say dem dey favour men? Tennis Head coach for Oyo State Sports Council, Saliu Tirimisiu say "pipo dey forget say umpires dem be human beings and e possible say dem fit make mistake." Im say "umpires dem dey try to dey fair and players no dey gree wit wetin di judges dey rule especially wen e no favour dem." Why men dey play more sets more dan women? For sports like football, man and woman dey play 90 minutes. For athletics, man and woman dey run di same metres weda na 100 metres or 400 meters. But why for tennis, na different tin? For di sport, men dey play game of five sets and women dey play game of three sets. Even though sabi pipo neva prove am, Tirimisiu say di believe be say woman no strong like man. Until now, no clear reason dey as to why but di only way wey pipo fit know, na for organizer to alllow women play di same set.